The results were worth the lessons and I loved the finished product. I cut pallet pieces to 46" and then hubby (who did a lot of the muscle work for me this time), screwed each board to the other in 4 places. One outside board shows the screws. We built the legs (cut to 13") the same way, but used just two screws in them. The bottom shelf was added by cutting out a channel for it on the table saw. Hubby did this while I stood by with a fire extinguisher because of the pallet nails that were hitting the saw blade. I used barn wood for the bottom shelf. After a few hours of sanding (and one very sore shoulder), I finished the beautiful wood with Minwax polyacrylic. If I were selling this table at a show or in my booth, I would charge 3 or 4 times more than I did for the special order (I believe in standing by word and charging what I said it would cost before I realized the time it would take to build). My sweet special orderee paid me more than I charged here, which I appreciated. 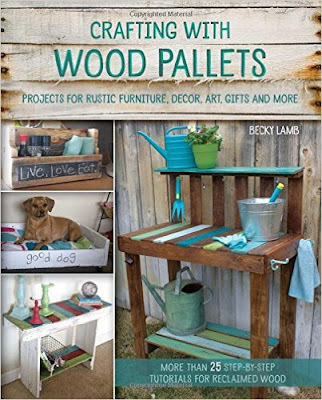 PS--if you want more pallet ideas, consider buying my book HERE! wow what a special table....love the personality it adds!!! GREAT project! Thanks Christine, I am happy with it! Very unique. I did something similar with scrap portions of 2 x 4's. I stacked & glued a number of pieces together & did this 4 times to make legs, then used longer pieces to make my son a bench for his deck. Good way to use up scrap wood. Thank you Deb, it is a great way to use up extra pieces! Just wondering...what would the price be on this piece? If I made another one I would charge around $400. That looks great, nice and sturdy and I bet it is heavy. Thank you, yes, very heavy Julie! ♥♥♥ the coffee table, it is so unique! I really love it! I can only imagine how heavy but it has sort of a masculine urban twist to it. I love your table!! It looks awesome in your living room.